Who doesn’t love a good giveaway? 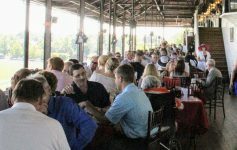 If you go to the Saratoga Race Course on these four special days, the New York Racing Association, Inc. (NYRA) will be giving out Saratoga swag to all track visitors with paid admission (while supplies last). Head over to the track, grab your Saratoga spoils, and display them with Saratoga racetrack pride! Track attendees on Sunday, July 22nd, will come home with a sporty Saratoga baseball cap. With the signature Saratoga red woven on top of the black cloth, this hat will stand out from the crowd. This giveaway item coincides with Saratoga Race Course’s 27th Annual Hat Contest — featuring hats of all shapes and sizes. On those bleak, rainy days, this sturdy Saratoga umbrella will take you back to sunnier times. A fan-favorite, this complimentary umbrella boasts the bold Saratoga Race Course logo and will keep you dry in any weather. This Saratoga blanket giveaway starts off the countdown to the world renowned Travers Day. This cheerful blanket featuring three Saratoga jockeys will add the perfect accent to any home or office. Bring a piece of the track with you wherever you go! NYRA celebrates closing weekend at the track with its final giveaway — a light and bright Saratoga windbreaker. This red and black windbreaker is the perfect way to sport your Saratoga pride in any season. Stay trendy and dry in this brand new jacket. 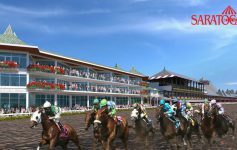 Saratoga Race Course opens just over two weeks! 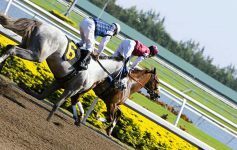 To learn more about giveaway days at the track, view our 2018 Premium Giveaway Page.